I eat quite a few vegetarian meals. Some are probably vegan as well, although butter and dairy products are pretty common around here. But it's not that I purposely decide to make a vegetarian or vegan meal. It's just that sometimes there's no meat or meat-products included. I have a few vegetarian cookbooks already - way backing the stone age, I bought some of the Moosewood books, and there's another really old one with a green cover. But I don't seek out vegetarian books these days. If I want a meatless meal, I know how to do it. But somehow I ended up with not one, not two, but THREE vegetarian/vegan books. And one of them is also targeted towards people with allergies. 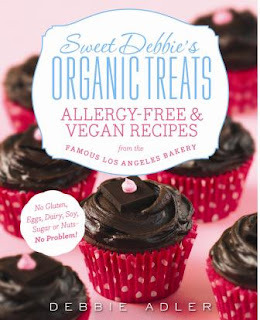 First we have Sweet Debbie's Organic Treats by Debbie Adler. This is the one that also pays attention to allergens. 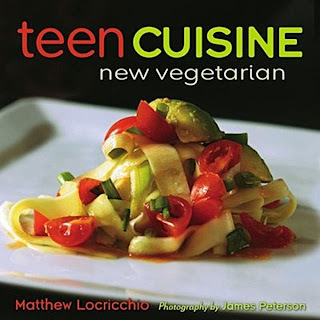 This is an awesome book if you need to avoid gluten, soy, sugar, nuts, dairy, eggs, and/or sugar. Which is not me. But I know people who do need to avoid some, all, or most of these common allergens. I paged though the book looking for something to make. Glorious photos. Pretty baked goods. But all the ones that looked good on first glance included things like coconut - one of the very few foods I don't like. And since these are gluten-free recipes, making substitutions would probably be a bad idea - I don't know enough about gluten-free sweets for me to be confident about making substitutions. Recipes aren't all sweet - there are herb and (vegan) cheese muffins - with cauliflower as a surprise ingredient, and bread, and "pizza wheels" along with the sweets like espresso muffins, dark chocolate cupcakes, and brownies. If you've got allergy issues or need to cook for someone who has them, this book should give you plenty of options. 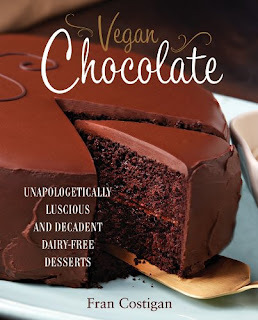 Vegan Chocolate by Fran Costigan is much closer to my wheelhouse. Since it's not confined to allergy-free ingredients, almond milk and soy milk play a part in many of these recipes. There are recipes that include coconut, but there are plenty that don't include it. 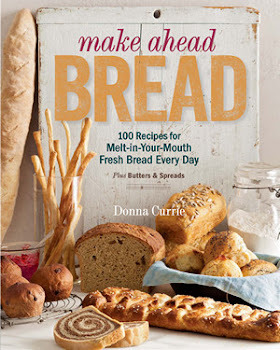 And since it's not a gluten-free book, I can make a good majority of the recipes in this book with ingredients I already have or that I normally buy. While the Organic Treats book is winging its way to a friend with multiple allergies, I'm going to be hanging on to this book. There are quite a number of recipes I want to try right now, and one that I'll be making as soon as I pick up a few ingredients I don't have, just because it seems soooo worth making. Check out this description of the No-Mallow Rice Crispy Treats: "This recipe is my answer to those who love Rice Krispie Treats, but want a less sugary alternative. And you don't need to find sometimes-elusive vegan marshmallows or mallow cream. Actually, it is my second answer, since the recipe is a chewier, more chocolaty update to the recipe in my last book." I'm sold. I used to like Rice Krispy Treats, but these days I can imagine how sugary they'd be. I love the idea of something that's not as sweet. Meanwhile, there are recipes here that would be perfectly at home in a non-vegan book. A chocolate cake recipe becomes vegan with the use of olive oil instead of butter - but there are certainly plenty of recipes for olive oil cakes that don't happen to mention that they're vegan. This book isn't going to convert me to vegan baking, and I might cheat on it a bit by using some non-vegan substitutes, like non-vegan chocolate chips. I'm going to say this book would be great for vegans, but also great for anyone who loves chocolate. 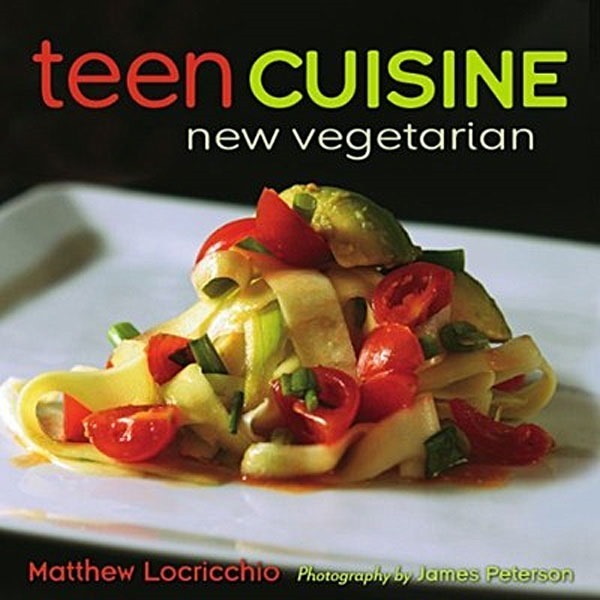 I'm pretty far from being a teen, but Teen Cuisine New Vegetarian isn't strictly for teens - I think it would be handy for anyone who is new to vegetarian cooking. I've had this book for quite some time, but for some reason I never got around to cooking anything from it until recently. A lot of the recipes seemed appealing, but every time I picked it up, I there weren't any recipes I could make right away. Which is kind of crazy, because I have a pretty well-stocked kitchen. It's not like any of the recipes required anything weird - it was more like I didn't happen to have all the ingredients all at once when I was in the mood to try a new recipe. Sure, I could have gone shopping specifically to make on the book's recipes, but I just never got around to it. But then I turned to the baking section and decided to make the chocolate cupcake recipe. I had to make one substitution - using almond milk instead of the coconut milk - but the recipe worked just fine. And ... I didn't actually make cupcakes. I had a spiffy new ornament pan from Good Cook that I wanted to try, and this seemed to be the perfect opportunity. The cupcake recipe in the book was supposed to make 12 cupcakes. It was almost the prefect amount to fill the four wells in the ornament pan with a little extra left over. Preheat the oven to 375 degrees and spray the ornament pan with baking spray. 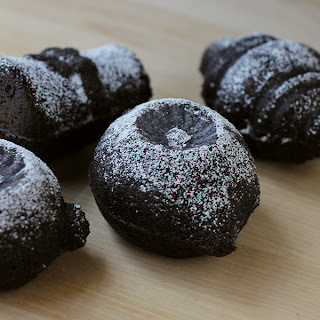 Combine the flour, cocoa powder (I used mostly regular cocoa powder and a little bit of Black Onyx powder, which is a very, very dark-colored cocoa powder. It goes by other names as well. ), baking soda, baking powder, and salt in a medium bowl. (I used a batter bowl for easy pouring later.) Whisk to combine and to make sure there aren't any lumps of anything. You could sift, as well. Put the almond milk and vinegar in a blender. The instructions said that after a few minutes of sitting, the surface would foam. I didn't notice that happening, so maybe that would only happen if I used the original coconut milk rather than the almond milk. Add the brown sugar, vegetable oil, an vanilla and blend on high speed for 30 seconds. Pour half of the liquid from the blender into the bowl with the dry ingredients and mix well. Add the remaining liquid and mix again. You're not looking to beat it - just mix with a spoon or spatula, or mix gently with a whisk. Fill the wells of the ornament pan - the bottom part - all the way to the top of each well. Put the top on the pan and bake at 375 degrees until a toothpick inserted in one of the top holes in the pan comes out clean - about 25 minutes. 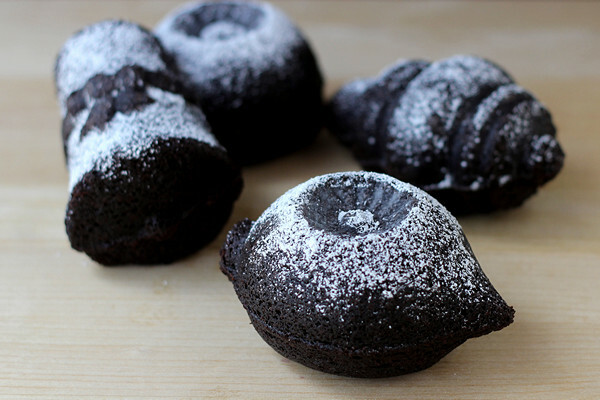 It's better to bake slightly longer to get a bit of a "crust" on the outside of the little cakes than to bake for less time and have the cakes too tender. Remove the top of the pan and let the little cakes cool for a few minutes - this helps the cakes firm up a bit - then flip them over onto a cooling rack. The bottoms of my cakes (the tops as they baked) got a little misshapen from the wires of the cooling rack, but no big deal - these things would be served sitting on a plate anyway, so only one side would be decorated and would need to look pretty. A different, denser cake recipe might hold up better and not get dented from the wires, but no big deal. And this one tasted really good, which is really the important part. Let the cakes cool completely before decorating. Or just dust with powdered sugar and call it a day. I thought the bright white sugar looked great against the dark cakes. Disclosure: I received these books from their respective publishers. I received the pan from Good Cook as part of their Kitchen Experts program.